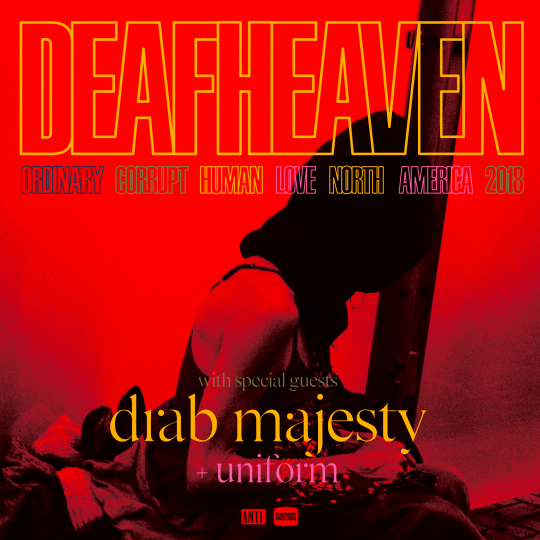 Deafheaven's latest record, Ordinary Corrupt Human Love, is their most divisive and expansive yet and at the Brooklyn stop of their latest tour, they let everything become a fully realized dream. Starting the night with the first two singles from your latest record may sound like a strange move, but Deafheaven have never stuck to tradition. Their musical complexity is an immediate showstopper and watching the band take these songs to life is nothing short of brilliant. "Honeycomb" was an instant rush of unbridled energy that set the course for the night ahead. The tremolo guitars were airtight, creating a heightened sense of intensity that never let up as the show progressed and while "Honeycomb" seemed to be the standout from the new record after a few weeks of listening, the magical moment exalted by the band came when the vocals kicked in on "Canary Yellow." The moment was par to none, almost setting the emotional peak of the night on song two and by the time the backing chants flooded the stage as the song ended, it became clear just how special this night would become. As the guitars gently faded into a more extreme dynamic, the drums began to thunder, and George Clarke struck a Jesus Christ pose at the absolute perfect queue. It was a moment that felt like one the band had been perfecting for years, not a song from an album released in the past two weeks. Clarke's showmanship has also enhanced over the past half decade, his confidence is shattering, bold, and consistently intriguing. Swirling his hips with a truly seductive face, he owns all that is before him and leads his crowd on a journey through extreme crescendos that hurtle forward with unbelievable vigor. As always, their shoegaze indebted guitar sonics feel larger than life when rippling across a crowd, weaving in another remarkable element to the band's incendiary sound. "Sunbather" felt like a cosmic blast of force that never seemed to let go of the crowd, gripping us all in the ebb and flow of the song's impressive and varied structure. The way the breakdowns in a Deafheaven song fall make it easy to watch the crowd erupt with passion and the night was packed full of moments like these and it was evident how much the band fed off the audience. It's one thing to think about these songs being pieced together in a studio, but witnessing the enchanting work onstage that makes these songs come alive is downright spellbinding. Their drummer is a machine and not once does he flinch or waiver in his ability to maintain the perfect stamina, allowing him to unleash such brutal power and control. New Bermuda leadoff, "Brought to the Water," also carried a weight of unwavering magnitude and by the time the band hit "Worthless Animal," it was clear that they knew the night was in their control. "You Without End" was an incredible start to the encore and Kerry on piano was a pure delight that helped bring the song into clear view. On record, the track sparkles with an ambient, dream-pop majesty that is accentuated onstage to the utmost degree. "From the Kettle onto the Coil" has perhaps the most enticing drum solo opening moment of any track this side of "Only Shallow" and helped the band transition into their curtain call. Finally, the night came to a close with "Dream House," without question the biggest triumph of the night and still a song that sends shivers up and down spines resulting in something that when recreated live instills a euphoric state of mind that elevates a crowd onto a new interstellar plane. Bearing witness to such beauty as it unfolds with such distinguished power from this band is a breathtaking moment and puts Deafheaven upon the upper echelon of extreme bands while still allowing for a melodic and warm embrace. They're a truly special group and seeing them live only helps to add a sparkle to their enthralling beauty. 04 "Brought to the Water"
07 "From the Kettle onto the Coil"